Our expert team allows us to manufacture and export an ample rage of Hospital Furniture. We take a special care in manufacture these products. These are modernly designed with salient features like, portability, durability, robustness and anti corrosiveness. More over our furniture are provided with much comfort than others. 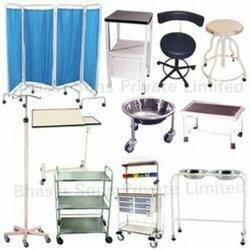 All the products listed under these categories are Railings nova-1050, Head Blocks Rigid nova-1521, Cervical Collar Adjustable, Bedside Locker General, Bed Side Locker Deluxe, Bedside Screen 3/4 fold, Bed Side Screen (3 Folds), Revolving Stool SS Top, Blood Donar Chair, Traumacare Crash Cart. 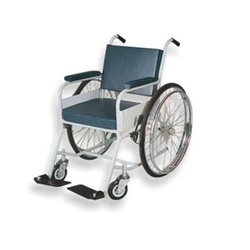 Seat Width Narrow : 15" to 17", Standard : 17" to 19"
Backed by the greatest state-of-art infrastructure, we manufacture and export an ample range of Invalid Wheel Chair Non Folding Special. These products are manufactured using best quality raw materials to ensure its reliability. It is provided with comfort seating arrangement and wheels to ensure easy operational performance and consistency. The wheels and frames provided with these chairs are made of rust-free materials, which ensure prolonged efficiency and life span. Rear 26” solid wheels with brakes. For more details refer to the attached pdf file. By means of wide distribution association, we offer a wide range of OT Equipment's that has a huge adequacy all over the world. These excellent grades of equipment are manufactured in compliance with the specification of international quality standard using premium quality raw materials. It finds its application in hospitals and clinics. 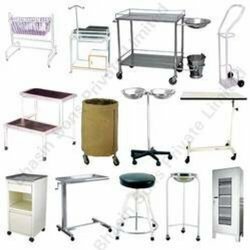 This wide range of equipment constitutes of screens, stools, trays and so on, which are widely reputed due to its esteemed reliability. stainless steel tubular frame mounted on four 150 mm dia.